After a fair amount of background work the planning team is pleased to announce that AvatarMeet 2016 is on in Pittsburgh, PA! Due to the limited availability of rooms at the hotel for group bookings, the 'formal' meet up will take place between Thursday, June 23rd to Sunday, June 26th. However, there is room availability on either side of these dates for which the group rate is still valid if you want to arrive early or stay later. Further details regarding the hotel and how to book your rooms is given below. See the information below for booking the new hotel and the other new details of AvatarMeet 2016 as it develops. If you have a concern with changing to the new location, get in touch with a Planning team member. We'll try and help best we can. NEW HOTEL booking & new Roll Call now open! As we're rebooting from scratch, you'll need to make reservations at the new hotel ASAP. All the details are on the Attendee Info page! We've also reset the AvatarMeet 2016 registration & Roll Call lists back to zero. While you (and the planning team) can see the archived information from Raleigh, you will need to re-register to attend AvatarMeet 2016 by updating your profile. It is more important than event to please keep your profile up to date as you book hotel and travel to help us plan the event on this faster schedule. Why did AvatarMeet 2016 move? Many of you saw Cirque du Soleil's post on facebook. "Cirque du Soleil believes in equality for all. It is a principle that guides us with both our employees and our customers. We behave as change agents to reach our ultimate goal of making a better world with our actions and our productions." This principal is of course in line with the themes of Avatar and the feelings of much if not all of the Avatar fan community. As saddened that we are that this situation has arisen, and while AvatarMeet remains a non-political organization; AvatarMeet agrees with Cirque du Soleil's ethics of respect for all and this action. AvatarMeet 2016 NEW location & dates announced! AvatarMeet 2016 will take place Thursday June 23rd - Sunday June 26th 2016 in Pittsburgh, Pennsylvania, USA. Cirque Du Soleil's Toruk - The First Flight tells a story that takes place thousands of years before the events of the movie. Three heroes embark on a prophetic journey to find Toruk and save the Tree of Souls. 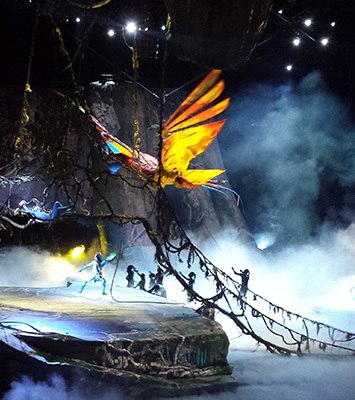 Toruk combines state-of-the-art visuals with classic stagecraft, puppetry, costume design and of course acrobatic and athletic skill to create a show that captures the tone of both Cirque Du Soleil and the universe of Avatar. Fans of Avatar will recognize nods to details previously present in the world of Avatar, while being delighted by fresh material as well. AvatarMeet is arranging group tickets to the show on Saturday June 25th at 8:00pm at the CONSOL Energy Center, so don't buy tickets to the show quite yet! But be sure to sign up on the 2016 Roll Call so we know how many to plan for! More information will be posted regarding other activities as they become available.